Pet food brand Natures Menu has had to recall its ‘Country Hunter 80% Farm Reared Turkey with Wholesome Fruit and Veg’ frozen pet food because of the presence of salmonella. The FSA released a Natures Menu recall notice as they are responsible for animal feed regulations as well as their enforcement for local authorities. 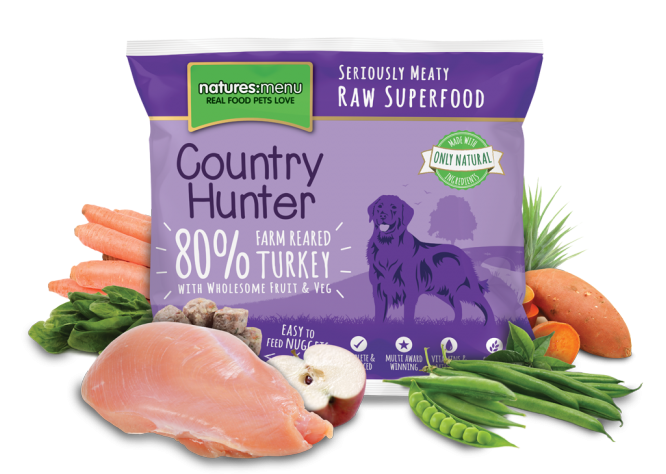 The recall concerns 900 bags of Turkey Hunter Raw Nuggets, of which 280 went to Norway and 600 to the UK. A bag was tested by the Norwegian authorities and found to contain salmonella, so the whole batch may have been compromised. The risk factor to humans is that salmonella bacteria can cause food poisoning. The product could therefore carry a potential risk through direct handling or indirectly for example from food contact surfaces. Hopefully not from anyone human eating this stuff! In humans, symptoms caused by salmonella usually include fever, diarrhoea and abdominal cramps. Infection from salmonella is not just a problem for humans, as it can also lead to quite nasty infections in pets as well, such as the dogs that this food is designed for. It is particularly a problem in this case because Natures Menu pet food is meant to be eaten raw, meaning that no bacteria will be killed by heating. However, dogs and cats are of course much more used to eating uncooked food. ‘We believe dogs and cats deserve real, wholesome food, free of artificial colours and flavourings, meat derivatives and other nasties.’ Which, assumedly, includes salmonella. Food safety is important for pet products, as well as those aimed at their owners!